The best way to learn about CrossFit is to try it out yourself. We are happy to modify any workout to meet your current fitness level. If you live in the McCall area, join us for a free trial. It’s easy to feel intimidated walking into a CrossFit gym, new routine with new faces. But here at Legend we promote an inclusive environment and encourage everyone to complete the workout to the best of their ability. Wear comfortable gym shoes, exercise clothing, and bring a water bottle. You will need to fill out a waiver held at the front desk. The coach will ensure you are familiar with the equipment utilized for the workout for that day. Your first few workouts will be light and scaled to your current fitness level. Remember, consistency over time creates a healthy lifestyle. We want to see you become a part of our fit community! We are always happy to see traveling CrossFitters, don’t miss your workout when you’re on vacation, come join us before you go out to play. We have Drop In rates and offer a 5 visit punch card for people familiar with CrossFit programming and movements. We have several membership options starting with a 6-month rate, a month to month rate, 5-visit Punch Card, and Drop In rates available. 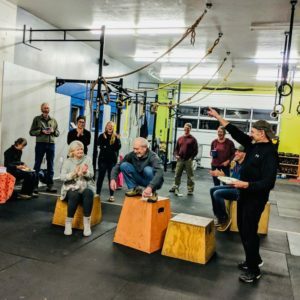 Out of fairness to our regular members, we do require Punch Card and Drop In members to have a CrossFit background or enroll in our introductory program before being eligible for Punch Cards or recurring Drop Ins. Personal training is available, please contact us for further information. This can be a great lead into any of our membership options and to help regular members fine tune specific movements. 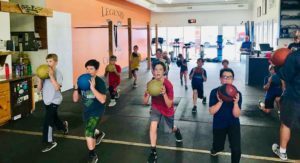 Personal training and small group sessions allow coaches to develop programming for your individual needs whether they be corrective movements or general fitness.